Just what we needed—another reason not to get up off the couch. Logitech’s Touch Mouse turns your iPhone or iPod touch into a wireless mouse, perfect for those moments when you want to do something on your computer without actually touching it. Although the application and its accompanying computer server software is slightly more involved installation-wise, it’s worth it, especially for ending the hassle of getting up and down to manually change programming when watching video from your computer displayed on a television. Two important things to know before you use Touch Mouse. First, your computer must be WiFi enabled. And second, you must have the free Touch Mouse server software running on your computer before you can use the application with your iPhone or iPod touch. So install the free Touch Mouse app on your iPhone or iPod touch. Now install the server software for your Mac or Windows PC (get it HERE <www.logitech.com/touchmouse>). Here’s a tip: Right above the Download Software button near the bottom of the Logitech download page is a link to “Touch Mouse Instructions.pdf.” It offers advice for Macs and PCs and is worth perusing before you start messing with this thing. NOTE: There is a PC version of Touch Mouse server but only the Mac OS X version of the server was tested. Once installed, the Touch Mouse server appears in your Mac’s Menu Bar with an “X” on it, as shown in Figure 1. 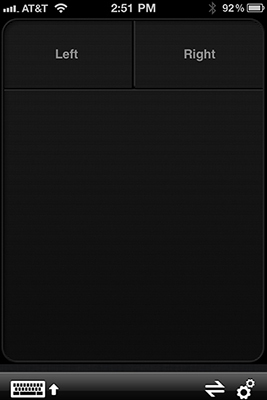 Figure 1: The “X” indicates that your iPhone or iPod touch is not yet connected to the server. 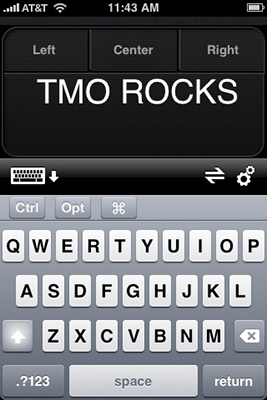 When you launch the Touch Mouse app on your iPhone or iPod touch it searches for (and hopefully finds) the Touch Mouse server running on your computer. But before you start using it, I urge you to explore its myriad of useful settings (tap the gears in the lower right corner)., as shown in Figure 2. Figure 2: Set ‘em just the way you like ‘em before you start. If you just want a plain old two-button mouse, make sure the Show Button 3 switch is set to Off. I encourage you to experiment with the tracking and scrolling speeds — when you get them just right the app feels almost as good as a MacBook track pad or one of those newfangled Magic Track Pads. Here’s another tip: Although there is an On/Off switch for the click and drag feature, I found I could usually click and drag even when the switch was set to Off. Figure 3: The Touch Mouse app’s trackpad and mouse buttons. At the top of the screen are two (or three) Mouse Buttons; they work like the two or three buttons on your computer’s mouse. The area below the buttons works like a trackpad. Drag your finger across the iPhone screen and the cursor on your Mac moves as it would if you were dragging your finger on a trackpad or using a mouse. Tracking is surprisingly smooth with very little lag or jumpiness on most Macs most of the time. To scroll up or down on your computer, place two fingers on the iPhone screen and move them up, down, or side to side. Just bear in mind that many of the options described above can be changed in Touch Mouse Preferences. If it doesn’t work the way I describe it, check your App’s preferences (the gears in the lower right corner). Tap the keyboard icon to use the app’s keyboard. When you do it’s almost like typing on your computer’s keyboard. Alas, this particular keyboard is not as intuitive or intelligent as most iPhone keyboards. More specifically, it doesn’t automatically switch between caps and no-caps or check your spelling. 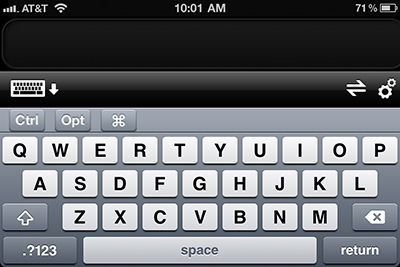 On the other hand, it lets you see what you are typing on your iPhone screen, as shown in Figure 4. I found this feature particularly helpful when I was too far from my computer to see the letters I’m typing clearly on its screen. Figure 4: Functional but unintelligent portrait-mode keyboard. By the way: You can rotate your iPhone or iPod touch to use it in landscape mode. But note that when you do the trackpad and mouse buttons disappear due to the lack of available space on the screen — a minor inconvenience. Figure 5: Landscape-mode keyboard displaces the touchpad and mouse buttons. In giving the Touch Mouse a thorough “Couch Potato Test” I find it quite slacker-worthy. While lying on the sofa I can easily see the screen of my MacBook Pro as it sits on the coffee table some five feet away (extremely far for a Couch Tater like me). I’ve tried using it while watching a movie, listening to tunes, reading and answering emails, and proofreading this review. I wouldn’t recommend it for extensive typing, but it’s great for controlling the cursor when your computer is several feet away. If you have a Mac you use as a media server that’s connected to a TV, this app may be the ideal remote control. For the most part it performed as promised with no trouble at all. That said, I did occasionally get a jittery, stuttering cursor. The problem would last until I disconnected from and reconnected to the server software. It was somewhat disconcerting so if it happens to you, just disconnect and reconnect from the server and it should clear up. To do that (disconnect your iPhone from the server) from your iPhone, just click on the disconnect button at the bottom of the screen (on the left of the Settings gears; looks like a pair of arrows). Or, to disconnect the iPhone from the server using your Mac, choose Stop Server and Exit from the Touch Mouse menu. There is one last thing: If you plan to type much, I found that using my Apple Wireless Keyboard ($69) keyboard with the Touch Mouse was great for any task that required typing more than a couple of characters on the iPhone keyboard. For watching video content on your television from your computer, Touch Mouse is extremely convenient. It’s also helpful when you don’t want to physically be touching your computer as you surf through websites and emails. You won’t want to type much text on its keyboard, but for trackpad control from afar it can’t be beat. Convenient, easy-to-use, does what it says it does and the price is right. A little more complicated to set up than most iPhone or iPod touch apps, dumb keyboard.